Zebra live in large herds with over thousands animals. They sometimes mix with antelopes, which additionally protects them against predators. Zebras are equids, members of the horse family. They quickly run from one side to another (zigzag) when they are trying to escape from predator. They live in Eastern and southern Africa. Within large herds there are small families that consist of one male, few females and their offspring. Parents keep good care of young zebras. Male will try to chase away predator in the case of attack. Zebras are social animals that spend time in herds (except Grevy’s zebras). Male zebra is called stallion and female mare. Their life in a herd can be complex, yet they also find safety in numbers. Zebras are fast animals. They can run 35 miles per hour. Newly born zebra can run an hour after it is born. Average life span in the wild is 25 years and up to 40 years in captivity. Zebra has excellent eyesight and sense of hearing. Height at the shoulder is from 1.1 to 1.5 meters (3.5 to 5 feet). Zebra sleep in the standing position. Weight is from 200 to 450 kilograms (440 to 990 lbs). Zebras are herbivorous and primarily eat a variety of grasses. They are also known to eat shrubs, herbs, twigs, leaves and bark. Stripes provide protection against predators because zebra live in large herds and too many stripes at one place usually confuse predator. Scientists aren’t sure why do zebras have stripes but many theories center on their utility as some form of camouflage. The patterns may make it difficult for predators to identify a single animal from a running herd and distort distance at dawn and dusk. Just as no two human fingerprints are alike, no two zebras have the same stripe pattern. Each zebra has individual pattern of stripes and these patterns can be used for the identification of the animals. Stripes may also help zebras recognize one another. Zebras communicate with each other with sounds and facial expressions. They have excellent hearing and eyesight and can run at speeds of up to 55 kilometers per hour (34 miles per hour). Since the color of their skin is black, scientists believe that zebras are black animals covered with white stripes. Zebras have a powerful kick that can cause serious injury to a predator. Usually the lead male of the herd, called a stallion, sounds the alarm if danger is spotted and stays at the back of the group to defend against predators if necessary, while the mares (females) and foals (youngsters) run away. Some zebras migrate during dry season. They can travel up to 500 miles per year to find place with more food and water. They eat grass and leaves. Zebras can't survive without water and they need to drink it at least once per day. There are 3 different species: plains, mountain, and Grevy’s zebras. Every species have different types of stripes, from narrow to wide. The Grevy’s zebra is the largest, weighing from 350 to 450 kilograms (770 to 990 lbs) and measuring up to 1.5 meters (5 feet) at the shoulder. They live in semi-arid grassland habitat in Kenya, Ethiopia, and Somalia. A mountain zebra has vertical stripes on the neck and torso, which graduate to wider and fewer horizontal bars on the haunches. They inhabit rocky, arid slopes in Namibia and Angola. The plains zebra is the most abundant and the smallest of the three zebra species. Some subspecies have a stripe pattern different from all others: brownish “shadow” stripes between the black stripes on their coat. They are found from the grasslands of East Africa to the scrubby woodlands of southern Africa. Most zebras are considered nomadic, without specific territories, except the Grevy’s zebra who mark their territories with urine and dung. The Serengeti is the site of what most consider the most dramatic migration, with giant herds of millions of animals—some 200,000 zebras and 1.2 million wildebeests as well as gazelles and eland—traveling from the Ngorongoro area in southern Tanzania to the Masai Mara in lower Kenya and returning as the rains dictate. Zebras can be 3.5-5 feet high (at the shoulder) and weigh between 440-990 pounds. 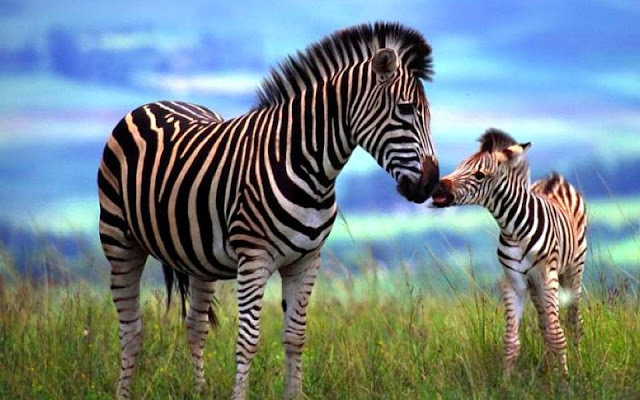 Zebra foals are born after an 12 to 13 month gestation period. They have soft, fuzzy fur, and their stripes are usually brown and white at first. The young zebra is able to stand shortly after birth and able to walk within 20 minutes of birth and can run after only an hour. This is important, since the mare needs to move with the herd to find food and water. Donkeys and horses are close relatives of zebras, but unlike them, zebras can't be trained and domesticated due to their wild nature. Foals must be able to recognize their mother from birth in order to survive. A foal learns its mother’s stripe pattern in order to follow her. Zebra foals begin to change to adult colouration after 4 months. Although a foal may graze within a week of birth, they continue to suckle for up to 16 months. It was previously believed that zebras were white animals with black stripes, since some zebras have white underbellies. Embryological evidence, however, shows that the animal’s background color is black and the white stripes and bellies are additions.